This essay was originally published as twenty parts, one at a time over the course of the month of September, in one post per day. My aim is that this will make the different perspectives and ideas less overwhelming and help in generating a broader dialogue. Is poker predominantly a game of skill or a game of chance? Most attempted treatments of this question are lacking in nuance, too detached from context, or too strongly-drawn to any of various salient but ultimately superficial points. With the recent uncharacteristically thoughtful and comprehensive ruling in U.S. vs DiCristina, the discussion is back into the mainstream and, potentially, ready to gain more traction in securing legal and social treatment of poker as a competitive strategy game, distinct from casino gambling. What follows is my best effort at filtering out the noise and condensing many years of my notes into a comprehensive overview of what I feel are the most compelling perspectives on the issue of skill and chance in poker. Some of these concepts may be obvious to my readers, but I do expect that everybody will find at least a few ideas to be new and thought-provoking. 1) Predominance between skill and chance is not well-defined. It would be intellectually dishonest to go any further without first acknowledging that the very notion of predominance between skill and chance, despite being the basis for many attempted legal classifications of games, lacks a logically-formal definition. Furthermore, legal standards of predominance do not have a history of being applied in a consistent or fully-defined way from which we could infer a precise definition. (It is worth disclosing that I am not an expert in law and will accordingly be focusing my treatment here on a more idealized world where mathematics, economics, and logic matter more than intuition, emotions, and history. I expect these perspectives will nonetheless offer some useful angles of reasoning for those who do defend our game in the real world). The most crucial logical hole in the idea of predominance is that it presupposes that a line can be drawn between pure skill and pure chance, upon which all games in human history could be placed and sorted, with some threshold on the line dividing between games which are predominantly skill and those which are predominantly chance. Players and other members of the poker industry are generally eager to provide subjective soundbites along the lines of "poker is 90% skill and 10% chance", informal arguments that assume that the contributions of skill and chance in a game should, together, somehow add up to 100%. This is a false dichotomy. Skill and chance are not opposites. 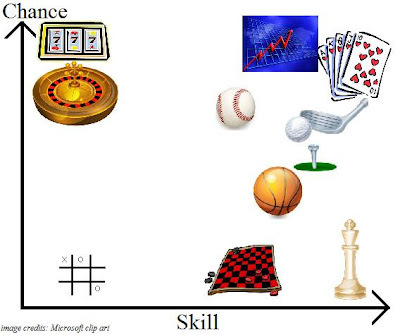 Skill and chance are not opposite ends of a continuum. It makes no sense to discuss predominance among two unrelated quantities between which no inherent quantitative relationship exists. To paraphrase an excellent analogy by Ike Haxton, arguing whether poker is predominantly skill or predominantly chance is similar to arguing over whether a large, gray rock is predominantly gray or predominantly large. The underlying question is plainly nonsense without context. Each side, with differing contexts and implicit assumptions, could produce a variety of informal arguments based on observations and assessments of which quality felt more meaningful to them. Numbers could be loosely and hand-wavingly thrown around, but they cannot hope to legitimately resolve anything in a purely logical way. Attempting to directly measure skill and chance against each other without expanding the question to something well-posed would be similar to reasoning that, because a given rock's shade of gray maps to 666666 in hexadecimal color code, and since the rock is only 50,000 pounds in weight and 666666 > 50000, that the rock must be "predominantly gray". Instead, skill and chance in games are each distinct factors of a game, much as how color and size are distinct factors of rocks. Temporarily assuming that there's a reasonable way to measure each of skill and chance independently, it's reasonably clear that some games have low chance and low skill (tic-tac-toe), some games have high chance and low skill (casino gambling), some games have high skill and low chance (chess), and some games have high skill and high chance (poker). Adding or subtracting elements of chance from a game does not impact the amount of skill present in the game. Note that my placement of the games in these charts is merely illustrative and completely nonscientific. This doesn't mean that there aren't any sensible ways to observe and relate skill and chance to each other. To get to a consistent and applicable definition, however, one must make additional assumptions about how the two qualities interact. In terms of formal mathematical logic, this would correspond to defining a function which maps both chance and skill (or largeness and grayness) into a single quantity. For example, in poker, any approach which looks at outcomes of play between different sets of players is implicitly utilizing a function which combines the influence of skill and chance into a single number at a specific time horizon. Different assumptions lead to different functions, which will yield a different ordering of games on the axis of relative influence of skill and chance. Different functions (i.e. different extra assumptions about how to measure predominance) will result in different rankings of the relative influence of skill and chance in games. Without specifying the function, there's not much ordering that can be done. 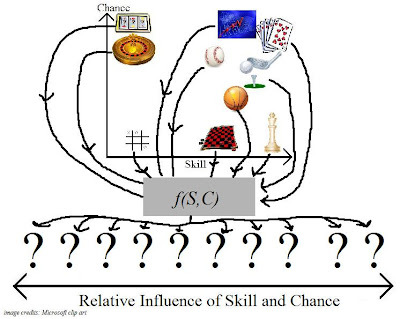 A game whose chance elements are increased while somehow holding skill constant can be said to have been made to have a higher relative influence of chance over skill, and vice versa. 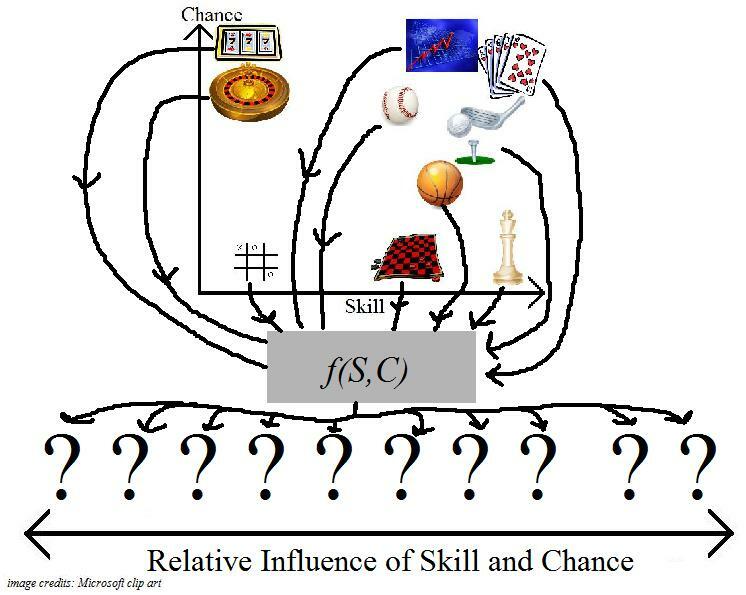 However, when skill and chance are both higher in one game over another, the ranking of relative influence of skill and chance between these games depends on the choice of function. I will delve more into some mathematical abstractions surrounding this later, along with other aspects of the impracticality and lack of coherence of various real-world perspectives (effective functional mappings) on predominance. For now, the point is that, once acknowledging that skill is not negative chance, there is no unique, objectively-motivated function to map the two together. Depending on the precise shape and means chosen of collapsing together the two-dimensional chart to fit onto the one-dimensional line of relative influence of skill and chance, different rankings of games will result.